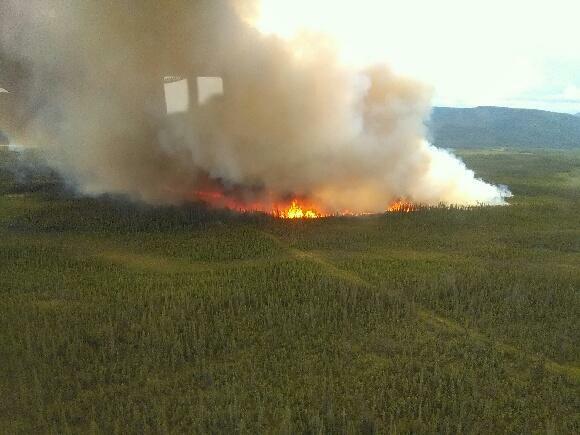 July 14, 10:45 p.m. – A 200-acre wildfire burning near Tok remains south of the Tok Cutoff Highway and south of the Tok River and state fire managers are hoping to keep it that way. Fire managers are trying to keep the fire south of the river and the road but had limited aircraft resources to work with because of dozens of other lightning-caused fires around the Interior that demanded attention. Two air tankers were headed toward the fire at approximately 9:30 p.m. to drop retardant on the fire in an effort to keep it south and east of the river. Two Type 2 initial attack crews from the Alaska Division of Forestry will join suppression effort early Friday morning. The crews will be inserted by airboat and helicopter to begin direct suppression tactics and to cut a fuel break around the perimeter of the fire. The fire is burning predominantly in black spruce but is flanked by old burn scars on the north (2004), south (2015) and east (1990) sides, which should help inhibit it’s growth. The fire was reported at approximately 5 p.m. as the result of a lightning strike and it grew rapidly to approximately 100 acres by 6 p.m. due to erratic winds caused by thunderstorms in the area. Visibility on the road could be impacted by smoke from the fire. Signs were placed on the road advising motorists to slow down and use caution due to firefighting equipment traveling on the road.